let the painting begin, finally! – RV Cheaper! January 26, 2017 January 26, 2017 RV Cheaper! let the painting begin, finally! We had wonderful plans of taking all our old papers to multiple shredding events around town but life always has other plans. Alice decided to start shredding and take our chances on destroying our poor shredder. Amazingly it survived, not only is it still working, it chewed up six 55 gallon bags of paper (packed down tight). We’ve only been able to fit one bag each week to leave room for our other household stuff in the recycle bin. The original pile was five bags, but we kept managing to find more boxes of $&!+ that filled bag number six! But at long last we made it, all of the stuff we are keeping is boxed and in the storage unit along with furniture we plan to have at our next place. 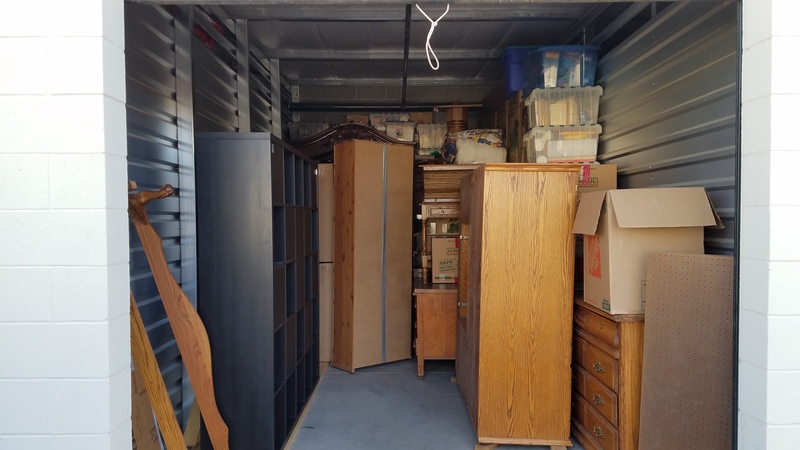 I’m pretty sure we will fit everything to be kept in the 10×20 storage until we settle in a new, much smaller home, just not sure if we will become full timers yet (hopefully decided before buying another place). Still lots of room for the last of our furniture that will go in once we have a contract on the house. We also thought we would be done painting before Christmas and be on the market first week of Janaury! Here is the last week of January and we are finally making progress painting, about 4200 square feet of painting! We’ve met with two realtors so far and thinking about meeting with a third one to see if we can find someone we are 100% comfortable with. The one thing for sure is we need to paint over all our unique green and light purple colors to get this place neutral. The only thing staying in the house is the beds, couch, a small desk, fridge and some food (that will move once the house sells). The basement was the first room we painted, it still had the flat builder white. 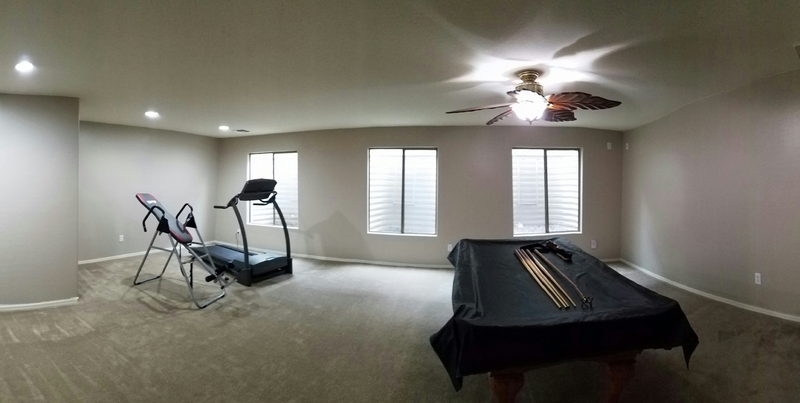 It’s been a great game room but our neon sighs , games and exercise equipment are gone (except for the treadmill and inversion table) We are hoping a buyer wants the pool table. Several friends and family think we are crazy to go to all this work, but we know we are competing with new and flipped homes that look & feel brand new. We have upgraded 2×6 walls, R40 attic insulation, Low-E windows and a 16 SEER A/C to compete with the new homes. Fresh paint and minimal furniture will hopefully put us almost on a level play field with both categories. So far we have the basement, office, three bedrooms and two bathrooms painted. I’ve started doing trim and corners in the dining room, living room, family room and kitchen before firing up the power roller again. The power roller takes about 45 minutes to clean up, so I make sure I have several rooms trimmed out before using it. I rolled six rooms on Sunday. The master suite will be the final frontier covering the dark red and tan we have loved in there. I was hoping for mid February to get the house listed, but it’s likely going to be the beginning of March with the pace we’ve been moving. We just keep telling ourselves, we are flipping our own house! I was just thinking yesterday wondering if it was listed. Now I know. I’m glad you’re thinking of a few more listing agents. Don’t under estimate your house! I think you will be happy you did all that work. We prepped our house before listing it and it sold in six hours for asking price. Good luck with your sale. Wow, thats awesome! We were thinking we will be thrilled if it sells in 2 weeks.